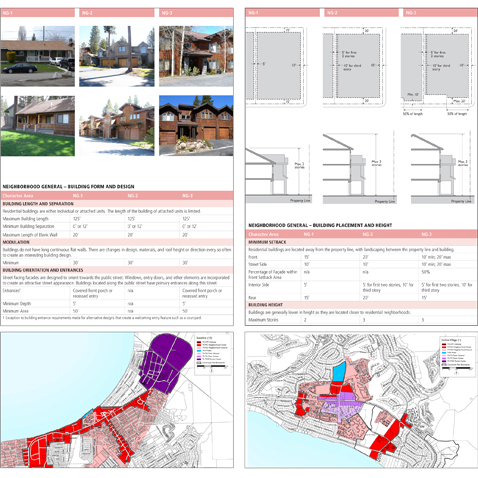 As part of the implementation program for the Regional Plan Update, Dyett & Bhatia worked with local jurisdictions throughout the Tahoe Basin to develop form-based development and design standards for the Town Centers and Neighborhood Centers to encourage environmental redevelopment. Dyett & Bhatia formed character-based development and design standards to create vibrant, mixed-use centers and streamline the development review and approval process. Topics addressed include pedestrian- and transit-oriented development, mixed use development, neighborhood-scale and land use compatibility, and natural resource protection. Dyett & Bhatia is also assisting with Area Plan Updates for Placer County and South Lake Tahoe.